RESERVATIONS ACCEPTED: Not for campsites. Only for the pavillions in the Day Use area. That is according to the Forest Service web site. If you look at Recreation.gov it appears you can reserve sites, but if you try to you get a message saying the site isn’t available. It’s idiotic, IMHO. GPS: Turnoff from Hapgood Road into the campground: N 43.25205, W 072.88960. See my additional notes below. 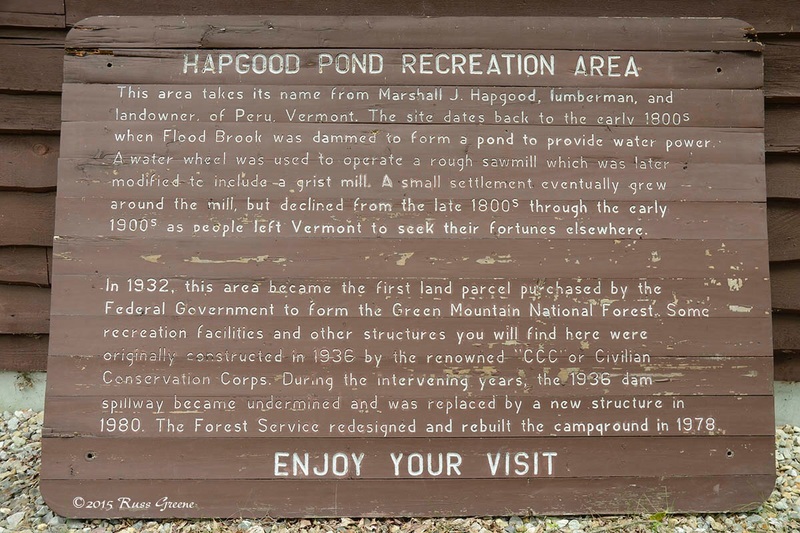 This sign at Hapgood Pond explains something of its history including the fact that it was the first parcel of land purchased by the government in the forming of the Green Mountain National forest. ACCESS: Roads to the campground are paved (see notes below). 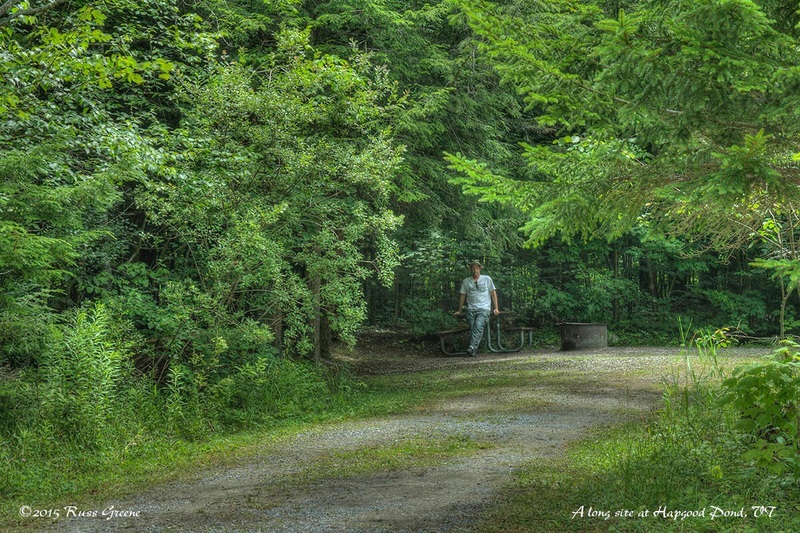 Within the campground, hard-surfaced dirt and/or paved in places–it’s hard to tell. I saw no indication of handicap accessible sites but there may be. SITES: 28. See additional notes below. MAXIMUM RIG SIZE: Recreation.gov says 35′. There are some sites long enough to accommodate longer rigs but getting to and in and out of them may not be possible. SHADE: Yes. Most sites are very shaded. A few get partial sun. A sign at this short length of fence along the trail that leads around the lake says “Barrier Free Fishing Access”. This means that it’s handicap accessible. This view of Hapgood Pond was shot from the spillway. You can see the beach and swimming area across the lake, umm, or pond, I guess. Over-the-air: I didn’t check. My bad. RESTROOMS: See notes immediately below. TOILETS: Within the campground itself there are vault toilets. In the adjoining Day Use area there are flush toilets and sinks but only with cold water. There are electric hand dryers in the Day Use restrooms. SHOWERS: Not in the campground but in the adjoining Day Use area. I ran the water in one of them for awhile. I don’t think it was really warm enough to have made for an enjoyable shower. 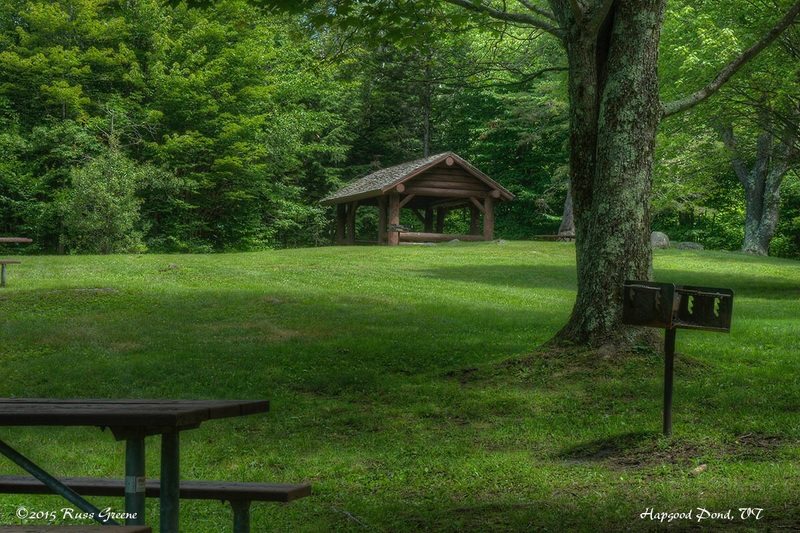 There are at least two picnic areas with shelters at Hapgood Pond. Technically, they may be in the Day Use area. I saw a Reserved sign on one of them which would indicate they can be reserved, probably for a fee. Propane: I don’t know if there is anything real nearby. I included myself in the photo of one of the larger sites at Hapgood Pond in order to help give some sense of scale. This site was very long. 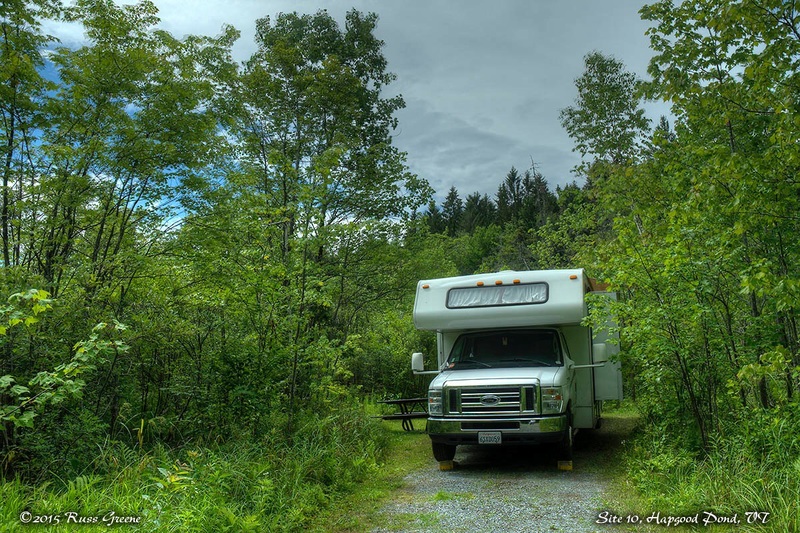 In terms of length, I think long enough for the largest of RVs but the campground road and trees would probably make it difficult for large rigs. At 30′ my Class C was scraping branches here and there. The sites aren’t all that wide, either. I wouldn’t recommend this place for motorhomes much larger than 30′. Hapgood Pond was a pleasant surprise. A little gem hidden away in the mountains of Vermont. I arrived not knowing what I would find or if I would find a campsite. My call to the Forest Service in order to ask about the place was not returned. 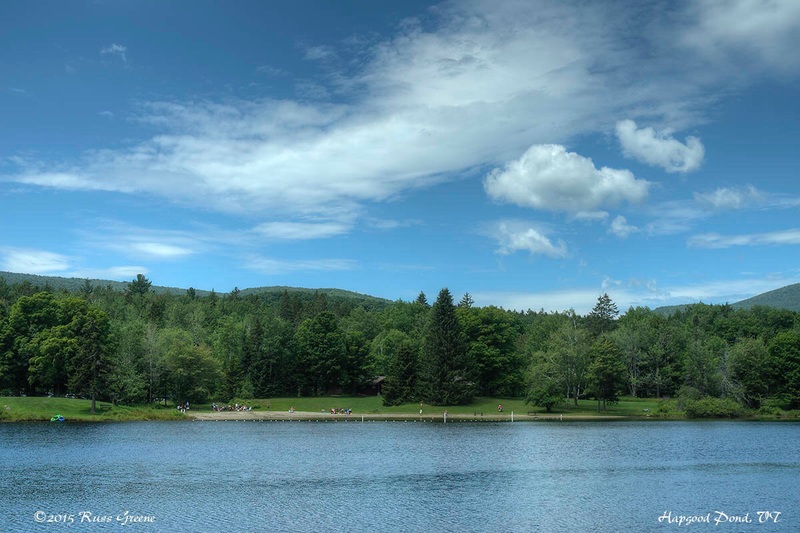 When I got there I found a small campground, just 28 sties, in a woodsy setting adjacent to Hapgood Pond, of course, and some lovely picnic areas. All for the bargain price of $10, or for those with an Interagency Pass, just $5 a night! It was Friday morning when I arrived and there were plenty of sites available. At mid-afternoon Saturday there were still a number of open sites. It’s all first-come-first-served, 14 day limit within any 30 day period. I approached Hapgood Pond from the east on state route 11. My GPS sent me up Lovers Lane as I got nearby. This is a short, dirt road and was in good condition but had I stayed on 11 just a smidge further I could have come up Hapgood Pond Road which is paved. The latter might have been a very slightly longer route but may have been as fast or faster because it is all paved. Also, at the time I visited Hapgood Pond a portion of route 11 to the east was closed and a detour took me out of the way maybe 15 miles, first north along 103 and then south via 100. I don’t know how long that detour is expected to be in effect. I settled into Site 10 because it was large enough and promised to get some sun for my solar panel. It was long enough for my 30′ rig but not very wide. I had to snip a branch to keep it from poking through a window screen and another to keep it from scraping against my rig in the wind. Oddly, Recreation.gov lists only 23 sites whereas the Forest Service lists 28. I was in site 10 which isn’t listed on Recreation.gov. Go figure. At 30′, I think my Class C is close to the maximum advisable for this campground. I saw one other Class C about the same size as mine and a 5th wheel with two automobiles in one site. Both the campground road and campsites are on the narrow side. There were tree branches that needed trimming overhead, along the roadside and in campsites too. I had to snip a branch or two in order that my rig not be in contact with them in my campsite. There was pretty good separation between sites and it was a woodsy separation. It was quiet at Hapgood Pond when I was there. Hapgood Pond road runs by the recreation area but it’s a little distance away from the campground and I doubt is sees much traffic at night. I didn’t notice any noise from the road in my rig. 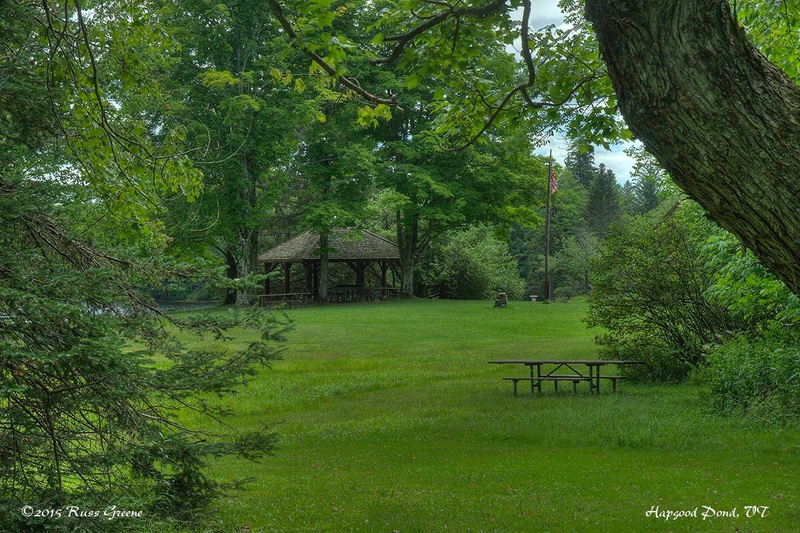 Picnic Area with Shelter: Hapgood Pond, VT. This is a lovely place. This photo was taken in July. There were a couple well maintained grassy fields with picnic tables, pavilions, and BBQ grills. 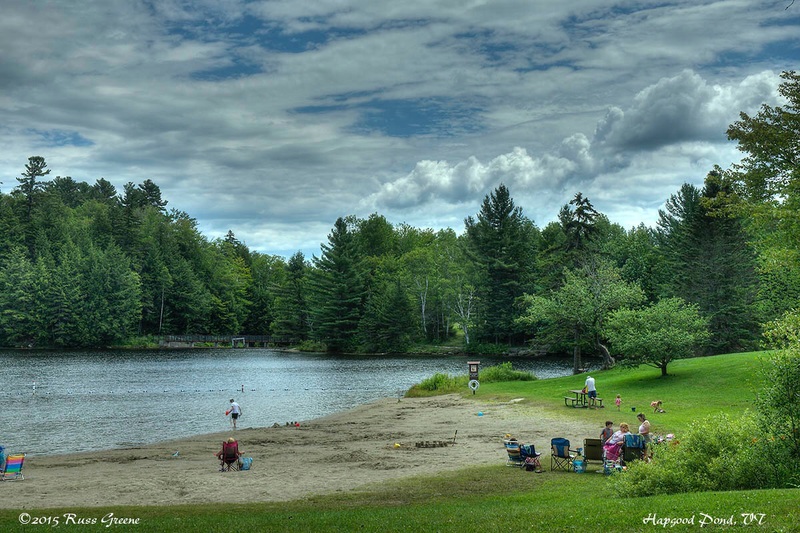 A Day Use fee is collected from people that come up to picnic, paddle, swim or fish. It wasn’t clear to me whether the campsite fee included access to the Day Use area but I rather expect it does. 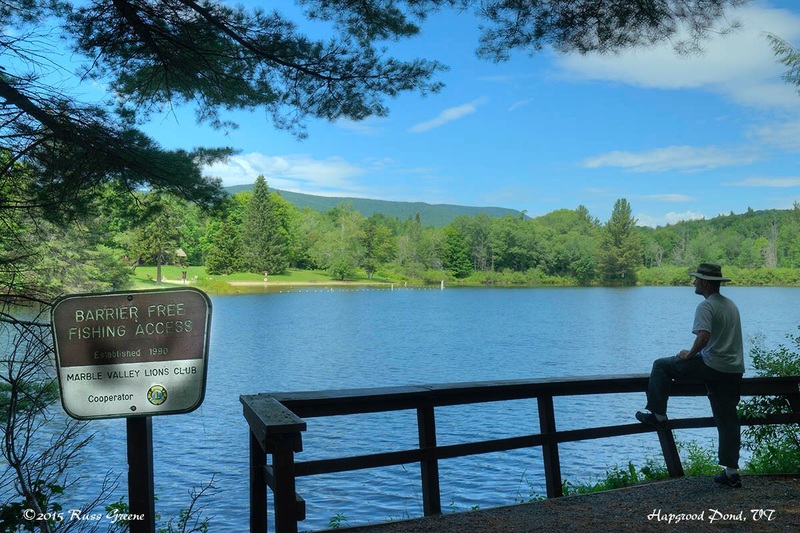 There is a “boat launch” for non-motorized boats which consists of a small spot along the shore where reeds have been cleared and kayaks, canoes and rowboats can be launched. A hiking trail leads around the lake. It’s about a mile long and undulates through dense forest cover. It makes for a pleasant walk. Along the way there are some signposts pointing out different kinds of trees. Trailheads are found off the campground road near site 16 and at the boat launch off of the Day Use parking area.